Thank you very much for your response, and your interest in this transaction, I am also glad to note that you are noble and trustworthy person whom I can rely on for your capabilities to handle this transaction. I am very encouraged by your sense of prudence. I am writing to assure once more that this transaction is 100% legitimate transaction and that you will not be expose to any form of risk for availing me this opportunity. As a professional banker it is my duty to ensure that this is transfer is done in a quiet manner, hence you will have to follow my instruction and act according to enable everything work out smoothly. Like I said before, due to this issue on my hands now, it became necessary for me to seek your assistance; I appreciate the fact that you are ready to assist me in executing this project, and also to help me in investing my money in your country. You should not have anything to worry about. I will do everything legally required to ensure that the project goes smoothly, it shall pass through all Laws of International Banking. Having resolved to entrust this transaction into your hands, I want to remind you that, it needs your commitment and diligent follow up. Firstly, i will like to know your age and the type of occupation that you do. You should note that this project is highly capital intensive. This is why I have to be very careful. I need your total devotion and trust to see this through. I know we have not met before, but I am very confident that we will be able to establish the necessary trust that we need to execute this project. I am now in contact with a foreign online bank. I now intend that you open an account in your name in this foreign bank. The money would be transferred to your account which you will open in the bank for both of us, this is the best way, I have found; it will protect us from my bank. Secondly, if you can really find time to travel to secure the funds for us in our offshore payment center in Europe ( Belgium ) which i think will be the best option for securing this funds for us.. Please keep me informed which will be at your convenient. I want us to enjoy this money in peace when concluded. As a professional banker i will advice you should listen to my instructions and follow them religiously. Be rest assured that this is 100% risk free and you don't have to worry as my attorney will put up all the paper work to make it legal. Also you have to know that I cannot transfer this money in my name, as my bank will be aware that it is from me. This is where I need you. As a result of this, if it is not convenient for you to travel to our offshore payment centre mentioned above, then you will have to open an online/offshore account in any of our corresponding bank that will be made known to you by my attorney who will file in an application for the release of the funds on your behalf. I will obtain a certificate of deposit of the said funds from my bank; this will make you the bonafide owner of the funds. After this, the money will be banked online for both of us. We can then instruct the bank to transfer our various shares into our respective home bank accounts. I will also perfect the documentations with the assistance of my attorney to give the transaction the legal right. Before I commence, I will need you to send me a copy of any form your identification (Driver's license or International passport) and your current address and also your private phone and fax number. I want to be sure that I am transacting with the correct person. As soon as I get these from you, I will commence the paper work with my attorney. I hope you will understand why I need all these. The money in question is big and I want to ensure that I know you well before I proceed to give you all the details to commence the project. 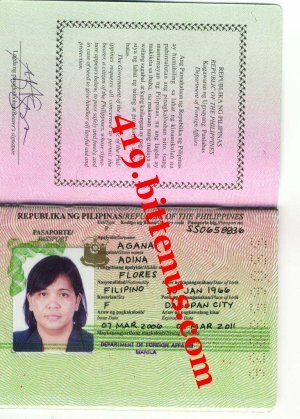 To further enhance your trust and confidence in me in this transaction attached is a copy of my international passport do acknowledge if receive; i will appreciate if you can send me a copy of your ID to me. Besides, it is the copy of your Driver's License or International Passport that will be used by the Attorney have all the necessary documentations perfected. I will send the name and contact details of the bank to you so that you can commence communication with them.